Create art in the round! Tweens will learn to use sculpting tools and techniques to create 3D sculptures.Tweens will go beyond just the hand-building process; they will learn more advanced techniques to refine and build their sculptures with carving tools. 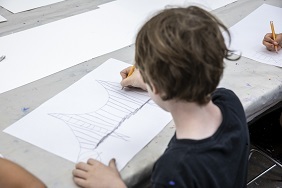 Students will work with a variety of sculpture materials and complete a 3D sculpture during this camp. Create your own characters for comics and story books! Tweens will explore gesture drawing, perspective, foreshortening, and figurative anatomy in order to draw amazing comics. Instruction will also cover illustrating facial expressions for characters, as well as developing facial features and structure.